This post is sponsored by P&G. Thanks to P&G I shopped at Walmart.com to order a few of our favorite P&G household items. With gift card in hand I was able to knock off one item from my HUGE to-do list! Like most of my friends and family - I feel like I am ALWAYS busy. My time is stretched thin between my full time job at the office, moments for quality family time, and everyday chores. Squeezing in the "me time" that I crave is tough to do these days. Just a small spot of time to myself for online activities, yoga, and the occasional veg-out would be awesome. The constant juggling can be a pain and the challenge of "finding enough time" is constant one. I need as many time savers that I can muster. One less thing to juggle makes me a happy lady! I shop online for many things and love the convenience of having my products delivered to my doorstep. Our delivery guy knows us and our shopping habits better than my best friends and family. Don't get me wrong - I do enjoy to occasional outing to a brick and mortar store BUT lately lounging at the pool with my family wins over spending the time it takes to load up the family, drive out to the store, find parking, and wander to every family members' favorite aisle! That's where choices come in. 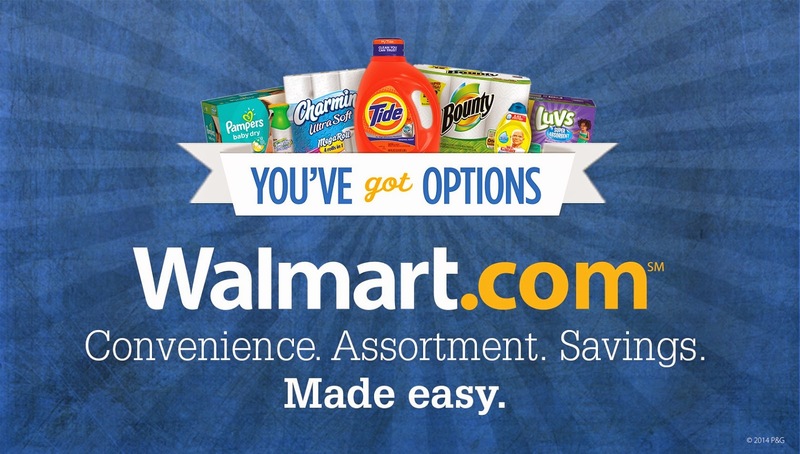 I love having the option of visiting Walmart in person, shopping at Walmart.com, OR shopping via an app on my phone! Choices for the win! Do you know that you can buy your household items from Walmart.com or via the Walmart smartphone app which can be downloaded here? By using the Walmart smartphone app, you can easily build a shopping list by scanning all the products you’re ready to purchase again. You can choose to have your purchase shipped directly to your house (shipping is free if you spend $50 or more) or shipped for free to the nearest Walmart location for a quick and easy pick-up with Site to Store. I visit the website and check out their Savings Center. I like to get the most from my money and will look for Clearance, Rollbacks, Special Buys, and Value Bundles. I make sure to check out the weekly Ad too! I opt for FREE shipping to my home and for some products I use the FREE ship to store option. Shipping to your door is FREE when you spend $50 or more at Walmart.com. That isn't tough for me to do because I do like to stock up! I don't get to keep all the shopping fun to myself! Thanks to P&G, you have a chance to WIN your own Walmart gift card! I'd love to know what you would buy and how you plan to shop if you win! In store? Online at Walmart.com? OR using the Walmart smartphone app? Disclosure: The Walmart gift cards and information have been provided by P&G. Sponsor is responsible for shipping the giveaway prize to the winner. ANYTHING to clean up messes. having 2 littles is MESSY! Melissa - I hear that! Good luck! They have so many great products! Tide, Febreeze, Pampers.. to many to list! Good luck! Thank you for entering the giveaway. My favorites are Tide and Dawn. Tide is a classic, I remember my mom used Tide when we were growing up. Thanks for entering Amy! Good luck! I like Bounty paper towels and Charmin toilet paper. Good luck Mami2jcn! Thank you for taking the time to enter the giveaway. I like Tide detergent and Bounty paper towel. HS popular choices. Good luck and thank you. Hi Tabitha, little ones sure do go through so many diapers! HI Neiddy! Thanks for entering the giveaway. Good luck. Nice Choices Elena. Thank you for entering. My favorite item is Tide pods they are awesome. HI Heather, haven't tried those yet. Thank you. I like the scent boosters, they make my laundry stay fresh longer. I LOVE LOVE LOVE fresh laundry! Tide Pods and Charmin and Paper Towels. Hi Steve - quite a few likes for Tide Pods! Thank you for entering the giveaway. My favorite P&G products from Walmart are Charmin Basic TB and Bounty paper towels. Thanks for sharing and giveaway. I love Pantene shampoo, Febreze, and Unstopables! Bounty paper is the best !! love your blog life by Cynthia, nothing wrong with being a late bloomer everyone life comes together at different times ! You're happy that's all that matters. I like Tide with Bleach, Pantene shampoo and conditioner and Downy fabric softener. We love Tide, Dawn, Bounty and Charmin. We use them all the time. I always get Tide, Bounty paper towels and Pantene shampoo! Venus Razors along with Tide Laundry Soap, Charmin toilet tissue and Bounty paper towels are my favorite P&G products from Walmart as well as must haves in our home. I like Pampers, Charmin and Gain. I like Febreze, Pantene, and Brawny paper towels! My favorite is Bounty Paper Towels and Charmin Basic Toilet Paper! My favorites are Olay Secret & Charmin - thank you. Awesome giveaway. We practically live at Walmart so this would come in handy! My favorite P&G products are tide, dawn, charmin, and downy, thank you! I love Bounty towels the most. It is always used in our house. I'm a fan of Bounty and Charmin. i love pampers products and bounty! I really want the steam mop. After sticky spills for 7 years now, I would LOVE to have an easy mopper. So many...Charmin, Tide, Downy & so many more!